Concerns about energy security and pollution are the drivers behind public policies designed to spur the development and commercialization of clean vehicles. Although the engineering aspects of clean vehicles are crucial, engineers have already pioneered advances such as lightweight materials, more efficient gasoline engines and transmissions, hybrid engines, advanced biofuels, plug-in electric vehicles, and hydrogen fuel cell vehicles. The missing ingredients in clean-vehicle policies are contributions from the social and behavioral sciences, including economics and policy analysis, that will guide the development of clean-vehicle policies that are both effective and cost-effective. The O’Neill Working Group on Clean Vehicles is sharpening its focus on the consumer’s perspective toward clean vehicles, especially the passenger cars and light trucks that account for the majority of the petroleum consumption and emissions from the transport sector. In previous work, we compared the public policies toward plug-in electric vehicles in the California, the U.S., China, the European Union, Germany, and France. The policies examined include the regulations of vehicle manufacturers as well as the public subsidies, tax credits, and incentives (monetary and nonmonetary) that spur or discourage use of clean vehicles. Since Indiana is one of the leading automotive manufacturing states in the nation, Indiana has a special interest in making sure that public policies toward clean vehicles are evidence-based, effective, and cost-effective. The Group has published several papers showing that substantial progress must be made with consumer awareness, knowledge, and incentives if commercialization of plug-in electric vehicles and hydrogen fuel-cell vehicles is to be effective. The O’Neill Working Group has recently completed an 18-month investigation of the cumulative macroeconomic impacts of three regulatory programs: the U.S. Department of Transportation’s Corporate Average Fuel Economy Standards, the U.S. Environmental Protection Agency’s Greenhouse Gas Performance Standards, and the California Air Resources Board’s Zero-Emission Vehicle Programs. The Group found that while the regulatory programs promise long-term economic gains in the US, the economic impacts will be predominantly negative in the near-term. The Group highlights a variety of refinements to regulatory and fiscal policies that can enhance both the effectiveness and cost-effectiveness of current clean-vehicle policies. Another team of scholars, as funded by the National Science Foundation, is researching the technological diffusion of electric vehicles and the simultaneous diffusion of electric vehicle policies, and the interactions between technological and policy development. Revised Macroeconomic Results Based on Light-Truck Forecasts Using CAFE Definition of a "Light Truck" released July 2017. Response to technical and policy issues raised by commenters. Sent to Secretary Elaine L. Cho, U.S. Department of Transportation, and Administrator Scott Pruitt, Environmental Protection Agency. January 2018 Cost Optimization Modeling for Efficiency Technologies (COMET) corrections to the report. February 2018 Cost Optimization Modeling for Efficiency Technologies (COMET) corrections to the March 9, 2017 report. These corrections relate to estimates of fuel savings, whereas the January 16, 2018 corrections relate to the COMET vehicle price premium. Response to EPA Administrator Scott Pruitt regarding EPA Mid-Term Evaluation of Greenhouse Gas Emission Standards for Model Year 2022-2025 Light-Duty Vehicles. Federal Register. 83(72). April 13, 2018, 16077-16087. SPEA received more than $790,000 from the Alliance of Automobile Manufacturers to study the economic impact of the 2025 federal corporate average fuel economy, greenhouse gas, and the state-level zero-emission vehicle regulations in California and at least nine other states. The goal of the study, July 2015-February 2017, was to forecast the economic impact of the requirements on passenger vehicle sales and employment. John D. Graham was the project’s principal investigator with a team comprised of Sanya Carley, Denvil Duncan, Saba Siddiki, Nikos Zirogiannis, Becky Snedegar, and SPEA students Joshua Cisney, Dan Esposito, Shilpi Goel, Alyssa Julian, Arthur Lin Ku, David Michael, and Celeste Wanner. 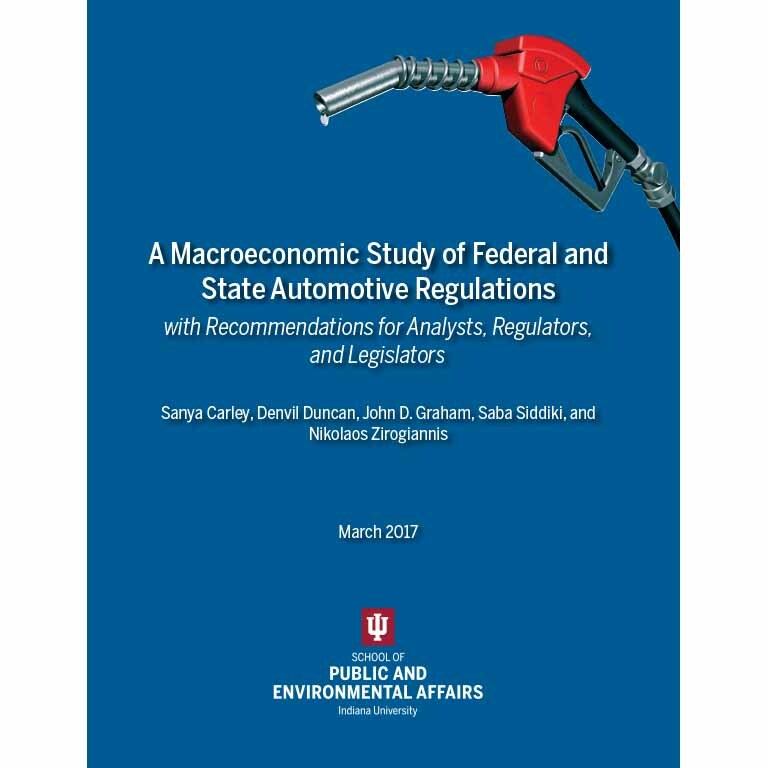 On March 9, 2017, the team released their final report from the 18-month study, titled A Macroeconomic Study of Federal and State Automotive Regulations with Recommendations for Analysts, Regulators, and Legislators. This report builds on the team’s preliminary report, Rethinking Auto Fuel Economy Policy: Technical and Policy Suggestions for the 2016-2017 Midterm Reviews. The findings and views expressed in the reports are those of the authors and do not necessarily represent the views of the Alliance of Automobile Manufacturers or Indiana University. The National Science Foundation awarded researchers Sanya Carley, Sean Nicholson-Crotty, and Saba Siddiki (Syracuse U.) a grant: “Toward the Diffusion of Sustainable Technologies: The Case of Electric Vehicles.” The grant is focused on technology and policy diffusion and the manner in which electric vehicles may (or may not) mitigate some of the persistent barriers that perpetuate the technological lock-in of the internal combustion engine.